The Y14 range features a curved key profile, reserved to customer specific special section, which has been proven uncopiable without an ABUS Y14 key blank, and thus customers with these Y14 sections can be guaranteed to have follow up key cutting business, now with the security of BSI*. 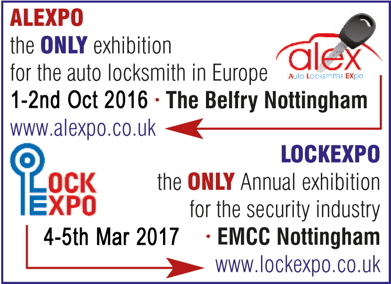 Tradelocks, Suppliers of the latest locksmith tools and innovations, will be exhibiting their extensive range of high quality auto locksmith products at the 2016 Lockex. 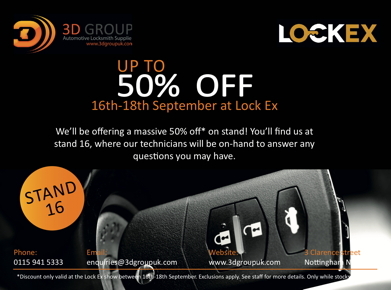 It's all about auto at stand 20 of the first ever Lockex! Taking place at the Ricoh Arena in Coventry on the 16th, 17th and 18th of September, Tradelocks will be showing off their auto range with a series of live product demonstrations throughout the day. The security company that employed the Orlando nightclub shooter has been fined for including false psychological testing information on forms allowing employees to carry guns. They are the latest craze to hit the high street - mobile phones so small they fit in the palm of your hand. But security sources fear the new generation of micro mobiles could let extremists recruit and plan terror from behind bars. The Mail on Sunday newspaper has established that their astonishingly small size - less than 3 inches - means growing numbers of the phones are already smuggled into jail and used by criminals and extremists.